The Denver Apartment Buildings For Sale website is proud to announce that Kyle Malnati is honored as one of REALTOR Magazine’s 30 Under 30 Award winners. May 16, 2012 — Kyle Malnati of Madison & Company Properties in Denver, Colorado has been named to the “30 Under 30” Class of 2012 by the editors of REALTOR® Magazine. Each year, the magazine recognizes 30 young practitioners who are making a mark in the real estate industry through success in real estate sales, business management, leadership, or community service. This year’s honorees are featured in the May/June 2012 issue of the magazine. “I am always astonished to see the “30 Under 30” professionals every year and all that they have achieved in such a short amount of time,” said National Association of Realtors® President Moe Veissi in May 16 statement. “What amazes me the most about this year’s class is how they recognize there is no one formula for winning in real estate. They have discovered success their own way and display the dedication and hardworking spirit all Realtors® possess. As Realtors® we are constantly evolving with the market and it’s important to recognize these young people and learn from them, as they are the future of the real estate profession,” said Veissi, broker-owner of Veissi & Associates Inc., in Miami. REALTOR® Magazine is the official magazine of the National Association of Realtors® and has been honoring young practitioners since the year 2000. For more information and to read profiles of all of this year’s honorees, visit REALTOR® Magazine online at http://realtormag.realtor.org/30-under-30. 1 million members involved in all aspects of the residential and commercial real estate industries. Information about NAR is available at http://realtor.org. 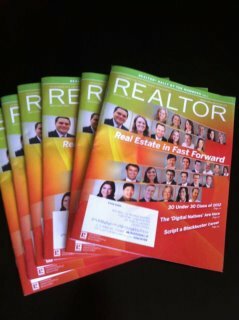 The magazine’s Web site is http://realtormag.realtor.org. REALTOR® is a registered collective membership mark which may be used only by real estate professionals who are members of the NATIONAL ASSOCIATION OF REALTORSand subscribe to its strict Code of Ethics. Not all real estate agents are REALTORS. All REALTORS are members of NAR.